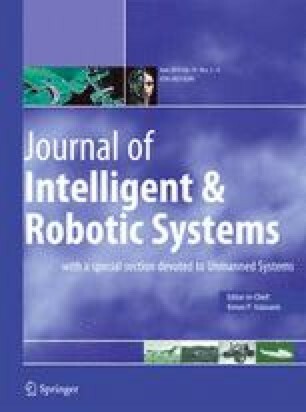 This paper presents the development of a vision-based neuro-fuzzy controller for a two axes gimbal system mounted on a small Unmanned Aerial Vehicle (UAV). The controller uses vision-based object detection as input and generates pan and tilt motion and velocity commands for the gimbal in order to keep the interest object at the center of the image frame. A readial basis function based neuro-fuzzy system and a learning algorithm is developed for the controller to address the dynamic and non-linear characteristics of the gimbal movement. The controller uses two separate, but identical radial basis function networks, one for pan and one for tilt motion of the gimbal. Each system is initialized with a fixed number of neurons that act as rules basis for the fuzzy inference system. The membership functions and rule strengths are then adjusted with the feedback from the visual tracking system. The controller is trained off-line until a desired error level is achieved. Training is then continued on-line to allow the system to accommodate air speed changes. The algorithm learns from the error computed from the detected position of the object in image frame and generates position and velocity commands for the gimbal movement. Several tests including lab tests and actual flight tests of the UAV have been carried out to demonstrate the effectiveness of the controller. Test results show that the controller is able to converge effectively and generate accurate position and velocity commands to keep the object at the center of the image frame.